I chose to stay home on Pennsylvania’s 2018 opening day of buck season. Weather stations were all calling for lots of rain and wind. One station made claims of possible 40 MPH wind gusts. I had no regrets. 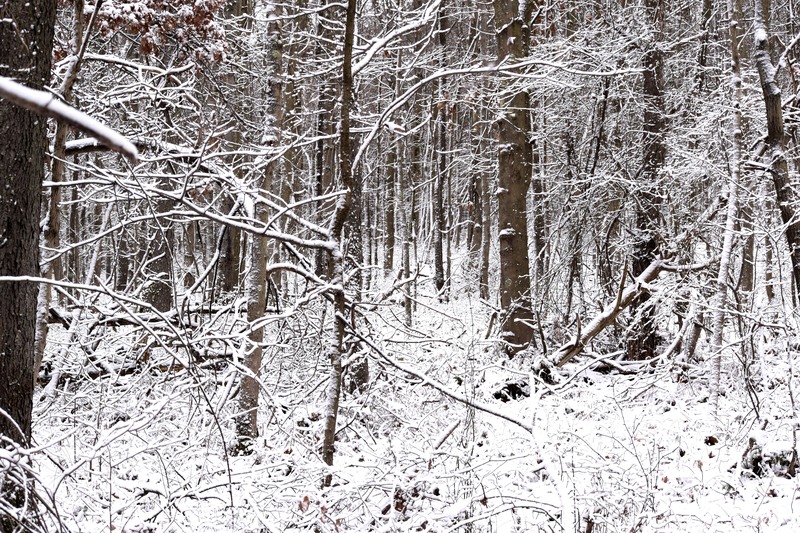 This morning, however, we had an inch or so of snow on the ground. The winds were still out there, in fact they were howling! I stationed myself downslope where the winds were not as powerful, but I could hear the racket across the hollow and behind me. Like I said the winds were howling! 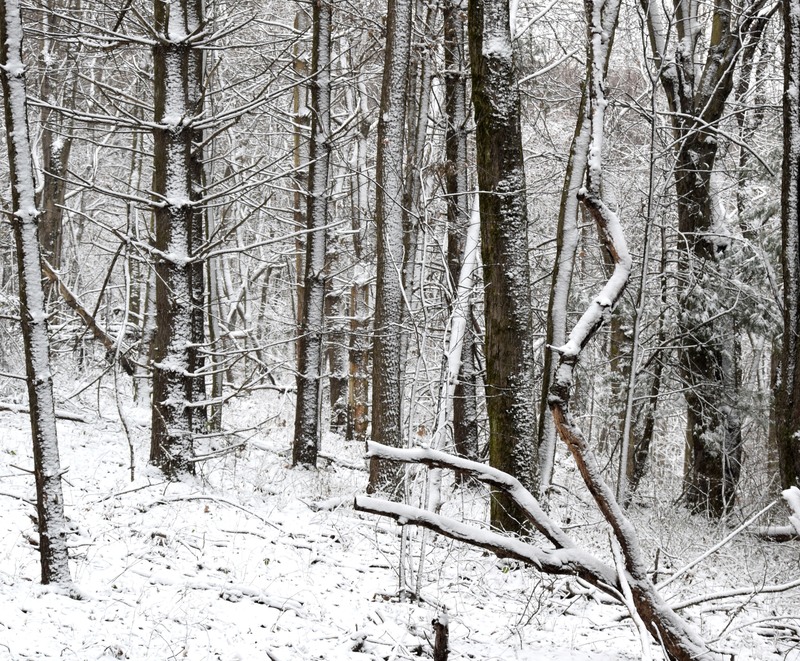 I didn’t know what to expect as I ventured into the snow-laden woodlands. many trees and lower canopy trees were covered with snow. it was a winter wonderland to behold. Little bird life was very absent this day. I only saw one squirrel, however, I was surprised to see a Chipmunk move across the snow. As I worked to get my camera in position the little striped critter went into a hole. 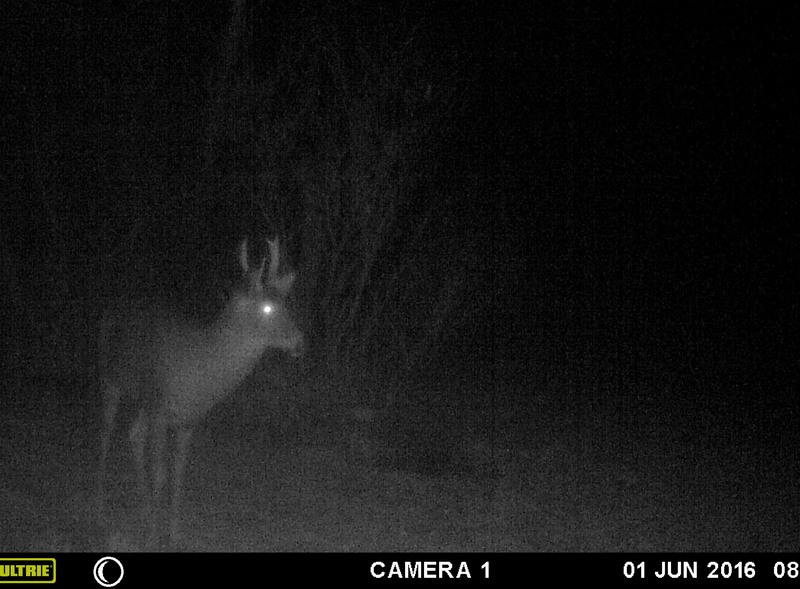 The first deer I saw cooperated greatly. Few deer do that in the wild. 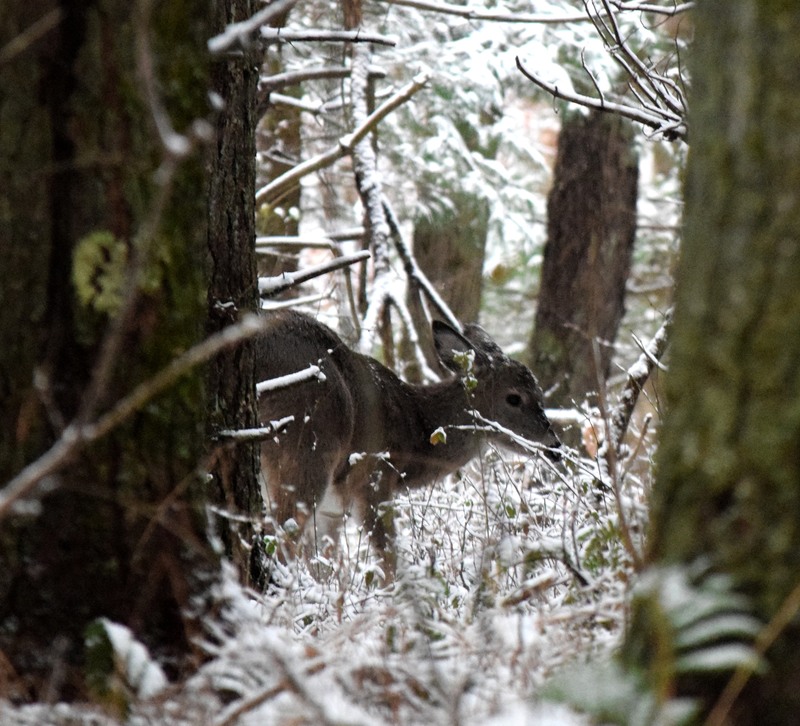 This deer came directly upslope to me feeding along the way. I managed close to fifteen or so photos. The next doe I saw came past me at about twelve steps in a full run. If that deer would have sported a thirty-inch rack I still would not have been able to get a shot. My best option would have been to throw the gun at the feet to knock it over. Ha Ha! I saw three more deer, but no buck. I quit around 1:00 and headed home. Barberry- I planted this years ago. 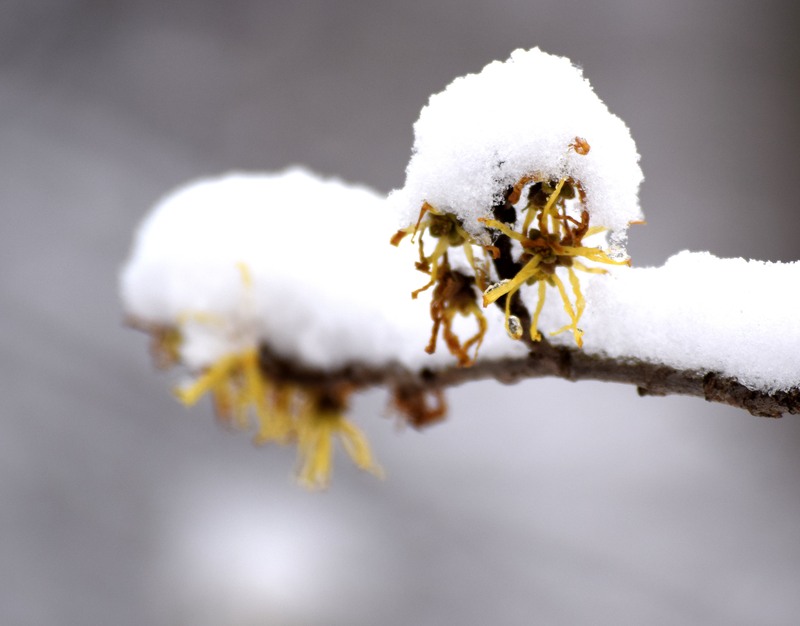 Witch Hazel blossom under snow. I spent some time this past week looking for a legal buck. 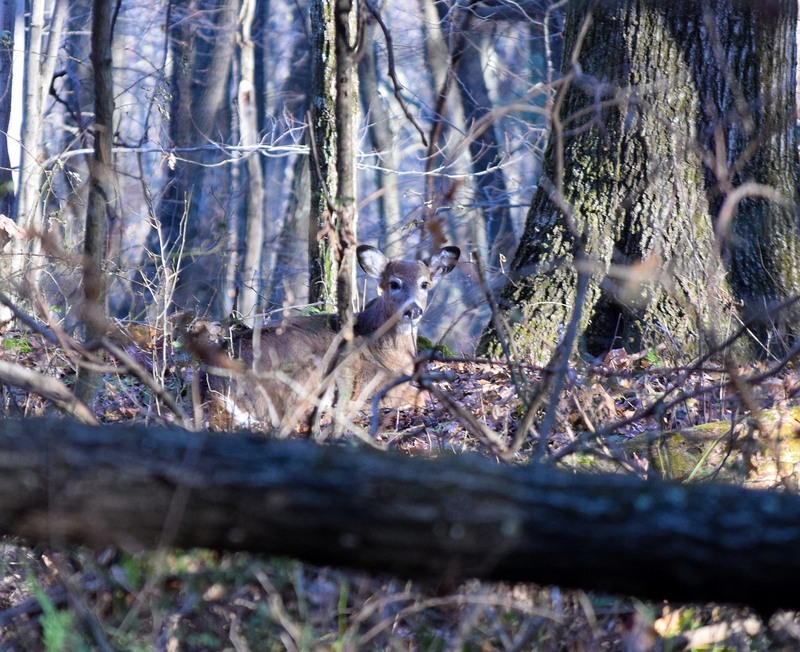 Unnaturally warm weather made me to not hunt full days, but I still managed to be out three mornings.I saw a number of does and one legal buck, but I didn’t shoot. The buck sported a legal antler on one side and a small spike on the other side. The monster walked to about twenty feet of me before seeing my shape. I jumped at him and off he went only to stop at about another twenty yards. he then proceeded to walk back towards me, but a little lower. The buck didn’t identify me and eventually walked up the hollow. 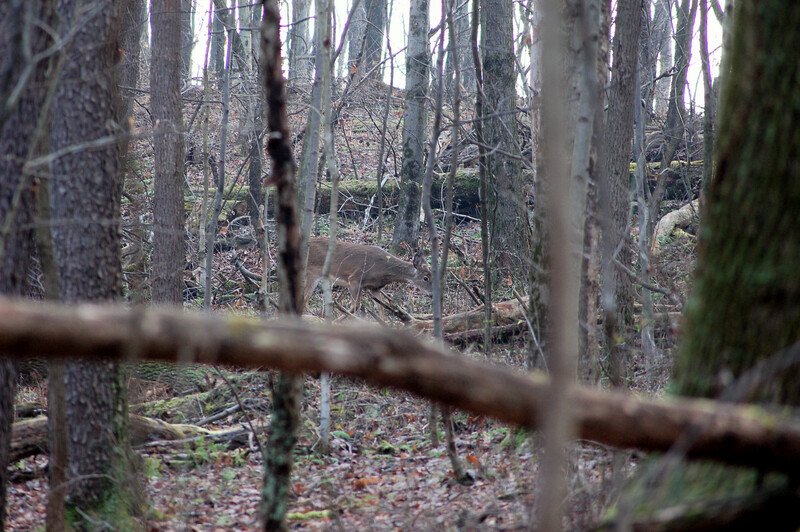 Another interesting time afield was when a doe bedded down about thirty yards from me. 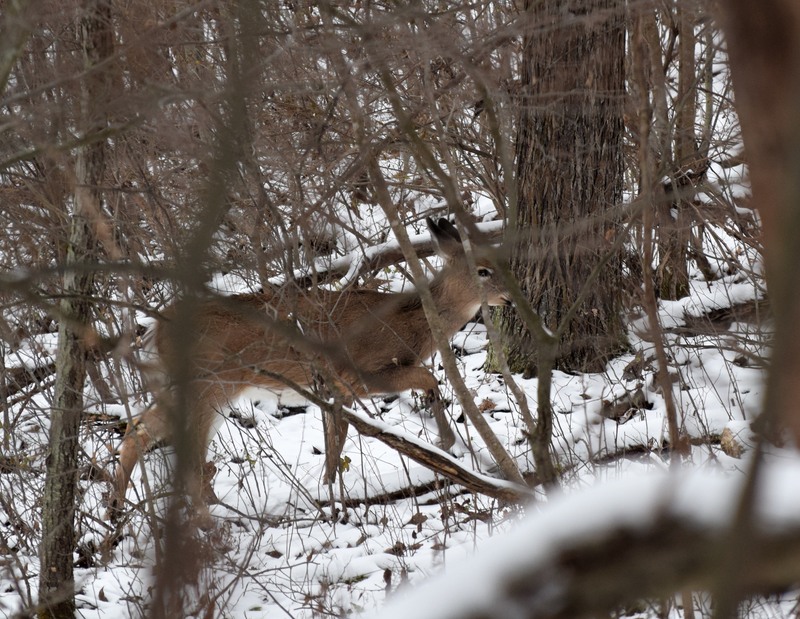 I watched another deer higher on the slope, but never identified it. The deer took off in a run as I watched a coyote walk close to where the deer was hiding. I, also, saw a Red fox this day. I had three does fed close to me one day. However, when I felt the wind change on the back of my neck, I immediately saw the one doe stick it’s head high and nose higher. In short order, they all went down over snorting all the way. I walked upon one bedded doe and managed a few pics before she unnerved. This morning a bagged a button buck. venison will feed me for a time. Other things that I enjoyed these days out were the hooting of a couple of Great-Horned Owls and gobbling turkeys. 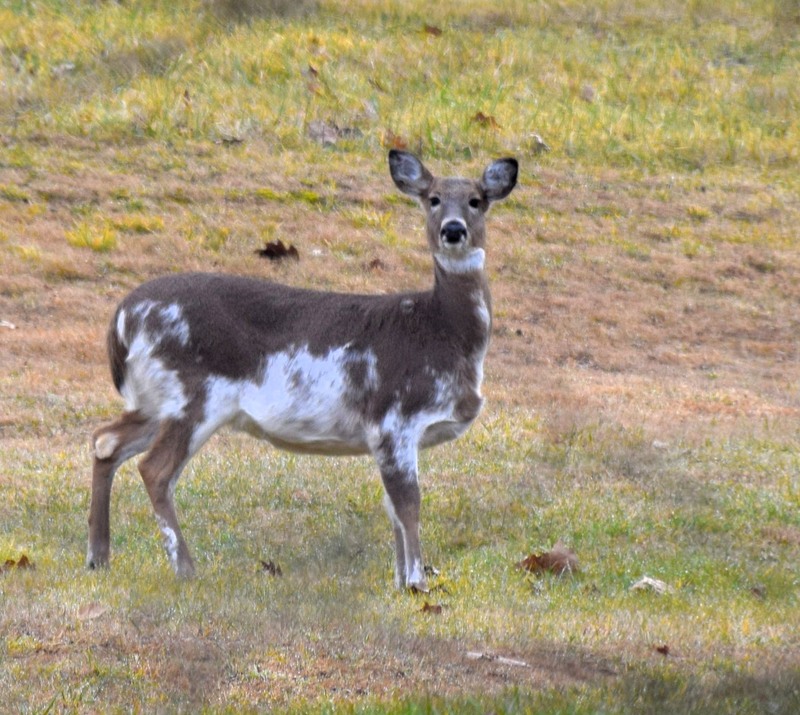 I saw a piebald doe and she stood still long enough for some photo ops. Great To Be Out Again! To say my buck/ doe season was short would be an understatement. The first day I elected to watch for a trophy buck. I saw one, but I failed to get an accurate “Horn” count. (Pennsylvania law in my area demands three points on the main beam to be considered legal. I saw fifteen deer this day. However, in the afternoon I began noticing an occasional cough. No big deal since I have asthma so coughs can happen at anytime. The second day I decided to not hunt for the temperatures were to get into the upper sixties. 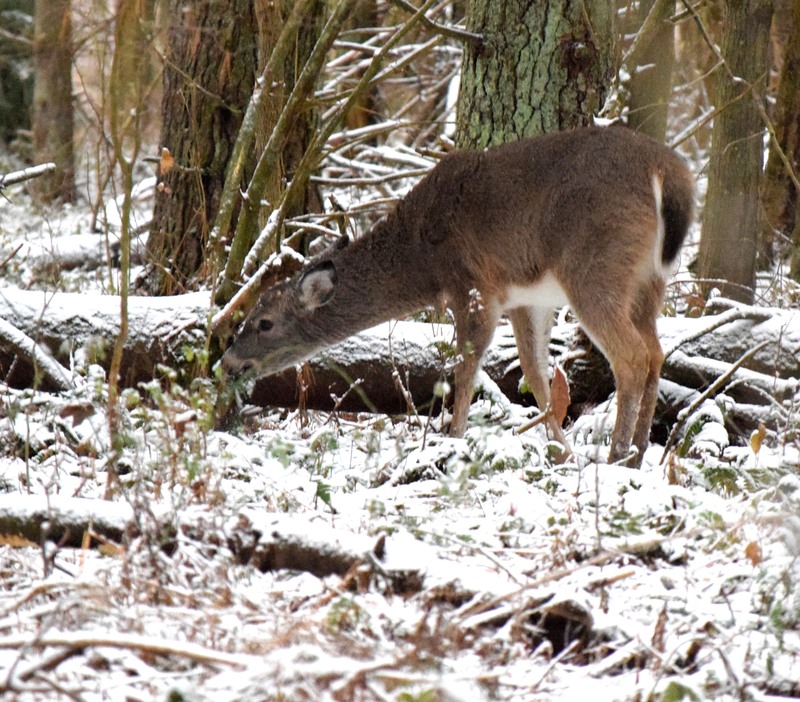 I process most of my deer and I don’t like to hunt if the weather gets to warm. However, I had a raspy throat when I woke up. 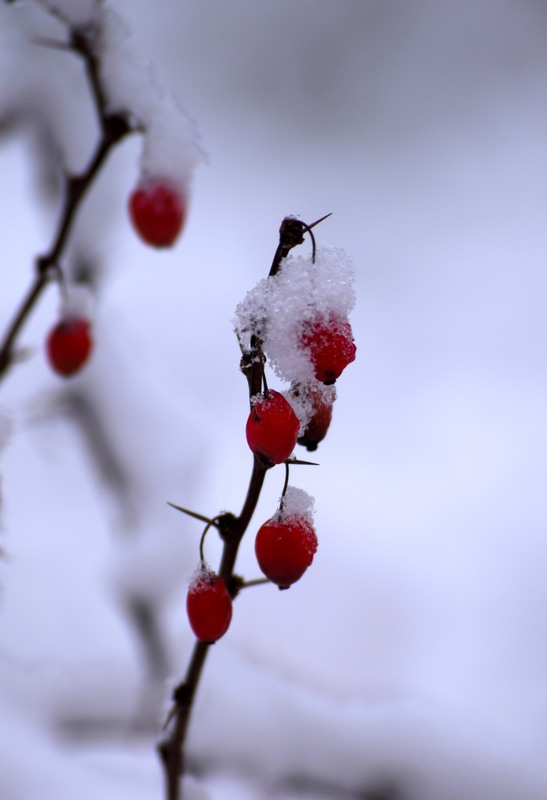 By evening I had a full-fledged sore throat along with shivering. From this point it was down bill! Later, I would feel as if I was getting well, but by evening the dreaded symptoms returned with a vengeance. I had to finally call a doc! 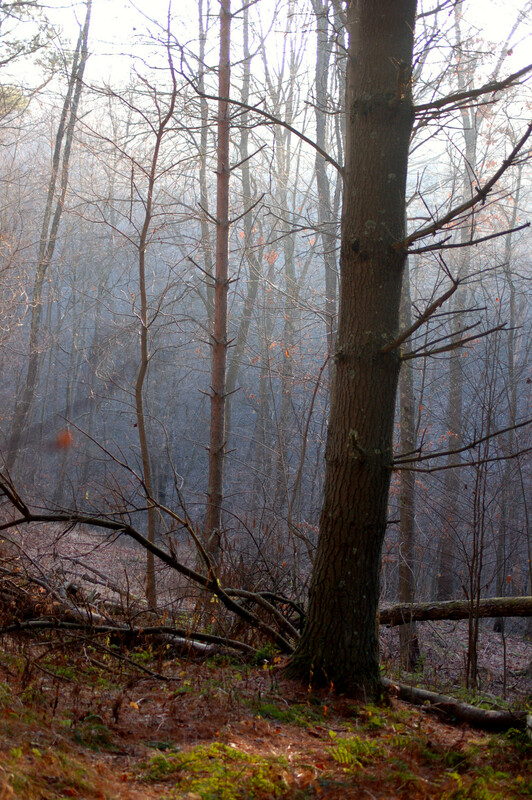 This morning, December 8, I had breakfast with family and was hiking the woods by 10:00. I soon noticed the one issue that was still happening within my lungs…a cough! I seemed to have a one-syllable cough about every 12-15 minutes. Oh well, I thought I was out and enjoying being in the woods. ALl total in the four hours I spent carrying my flintlock I saw eleven deer. 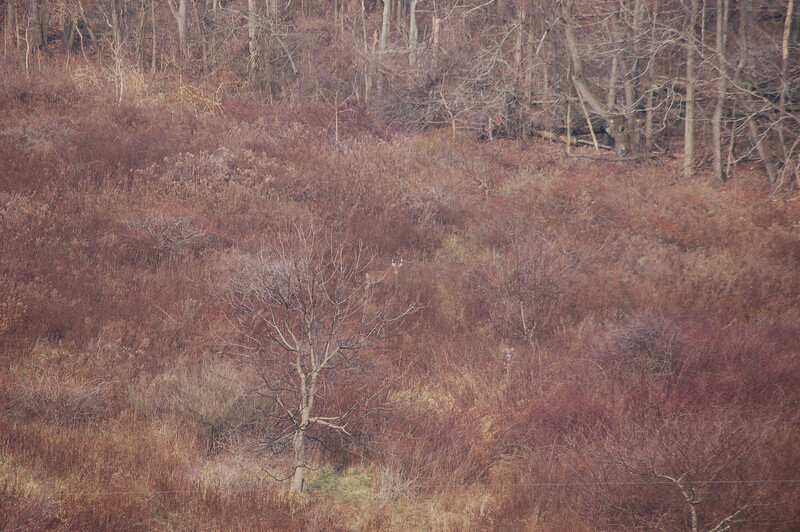 I spotted a deer’s back at one point in a heavy brush area. I stopped and moved to a tree to hide behind. Two deer showed up. One deer began to walk towards me. Something gave my presence away to the deer. She would stare and walk towards me. Soon she was well within range and offering a great shot. Big problem was my flinter was not in position to shoot. I thought she will look away at some point allowing for the rifle to get aligned. Problem comes to reality! I felt a cough. I suppressed it. Cough number two come to be and I suppressed it, too. Cough number three irritated my inner being to the point suppressing wouldn’t work. All of sudden a lung cough exploded from deep within my lungs as I watched two white flags bounce away. More coughs followed. I guess I was being told to not mess with those coughs. I was a little upset because most everything was going well. 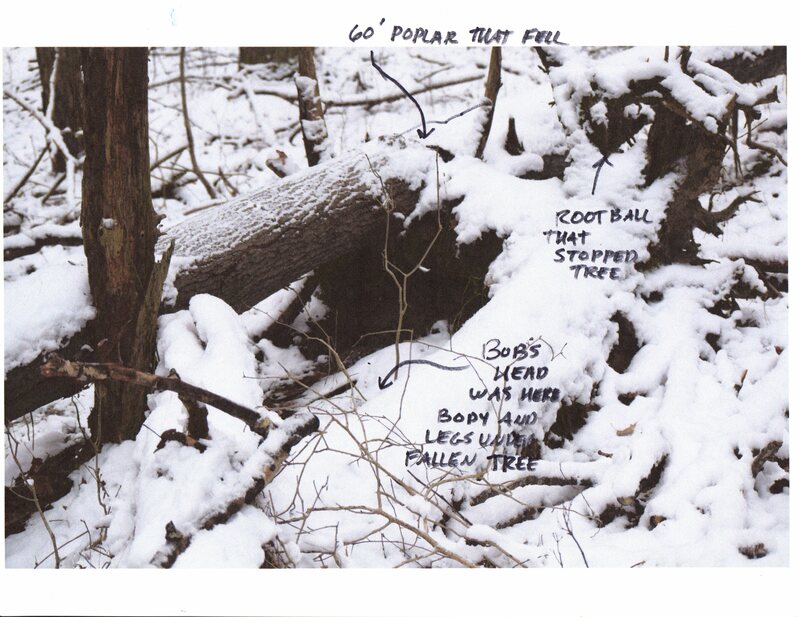 I thought I knew this could happen and continued to look for deer. I saw about fifteen turkeys at various times. I was tired by the time I returned home. My step father, Bob, and I, spent half a day pursuing whitetails! And the day was wonderful! Bob walked down n old right-of-way while I circled to push out some deer. I sent a couple past him, but a shot was possible. I walked up to him to discuss what had just happened. I told Bob, “I see movement!” I felt certain I saw a part of a deer. Field glasses were worthless for we were facing the early sun. Bob remained in position and I walked back the same route he recently walked down. I spotted two deer bedded down. I believe these deer allowed Bob to walk past and remained tight. I looked back and made some motion of deer bedded. I continued on. I should have motioned Bob to come forward to see if the deer would have held their position. the shot would have been reasonably close…approximately 35 yards. 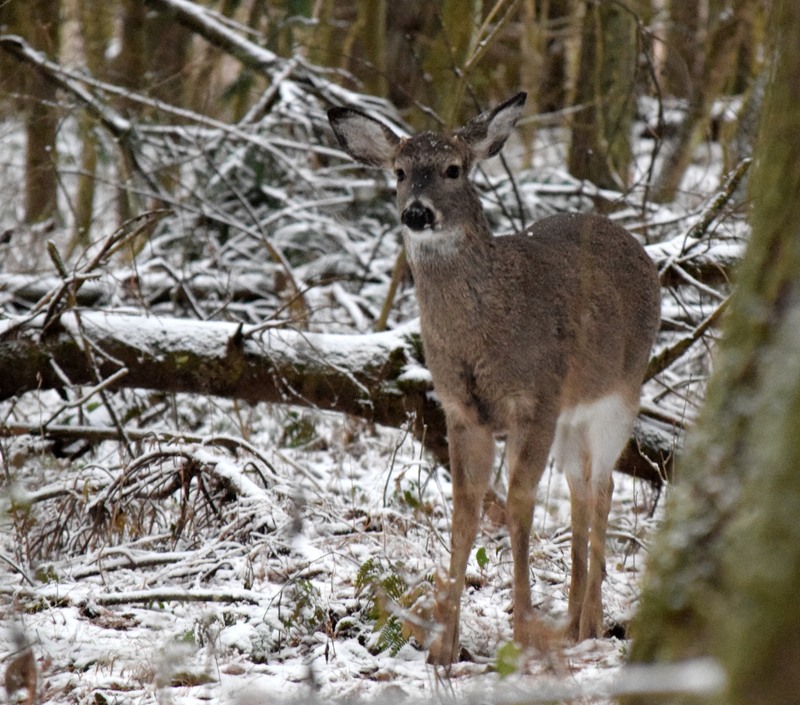 Bob has trouble seeing deer in those conditions, so I continued up, and over, and walked in behind them. The deer got up and stood. Another great shot for me if I would have been hunting. Bob held off for he wasn’t sure where I was at. I was seeing an ear moving. 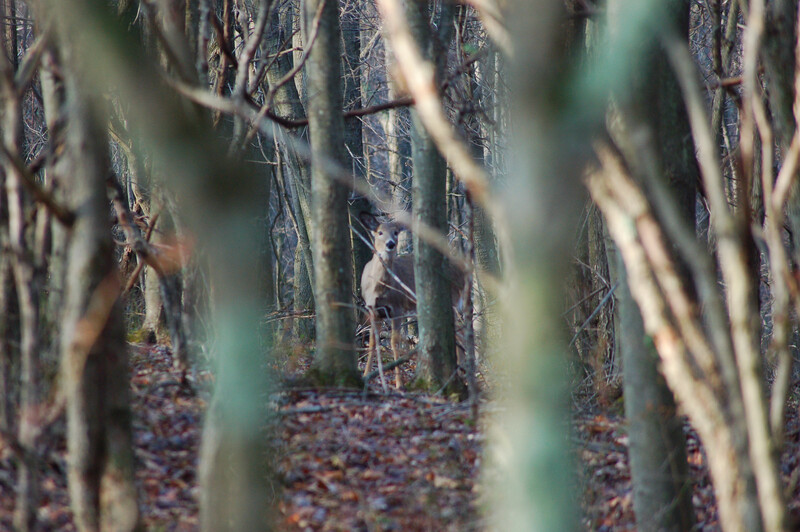 I backtracked and circled again and watched as the deer walked to me. I went back and motioned Bob to come back up to me, and we walked along a field’s edge. Bob repositioned as I tried to move the deer around. I walked backwards and entered the woods, and immediately saw a deer leg. The deer moved out. I played tag with these deer. I saw them four times again in less than two acres. Finally they moved past Bob. He didn’t get a shot. Again, I was getting unbelievable chances for close shots. We walked side-by-side as we walked along. Suddenly, a deer crossed in front of us, and she was only about 25 yards. She looked at us, and began feeding. Bob wasn’t sure if he wanted to shoot the small deer, so he hesitated. After a few minutes this deer turned back towards the way it came and started to walk. Bob decided he was going to shoot, but he missed. I played the sceneraio out searching for any sigh of a hit. Bob must have pulled the shot for the deer was very close. We had a lot of deer sightings before heading back to mom’s for brunch! My step father, Bob Miller, and I situated ourselves about forty yards apart this morning. The field we were watching has a lot of terrain contours so our separation allowed us to see the entire field. I have another antlerless tag, but I wasn’t carrying a firearm this day. I am waiting for flintlock season. The ground surface was white with frost. I was literally prone on the ground enjoying a beautiful sunrise and listening to a little turkey chatter from across the hollow, when I saw a doe walking into the field. She was followed by two others. 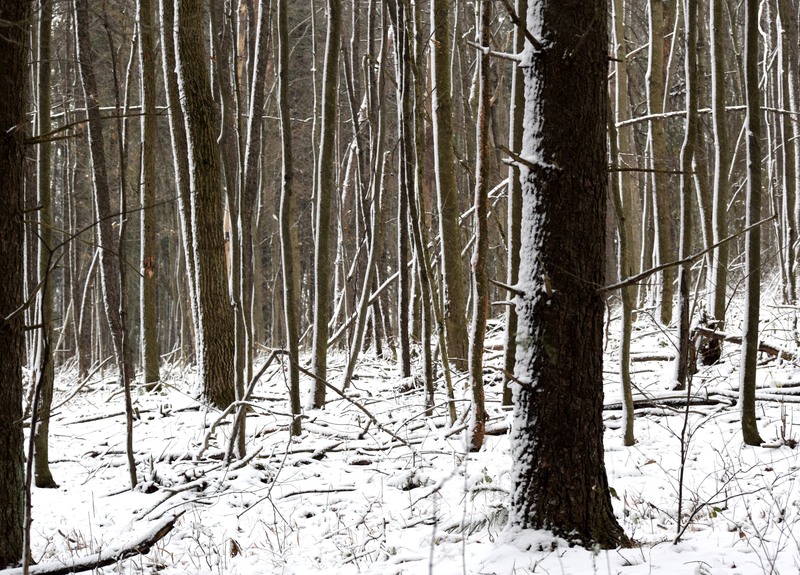 I whistled to Bob, and motioned him to walk backwards into the woods and come to me from behind. Unfortunately, the deer were not in the mood to stay for long. Bob managed to see the three deer briefly before they entered the woods. 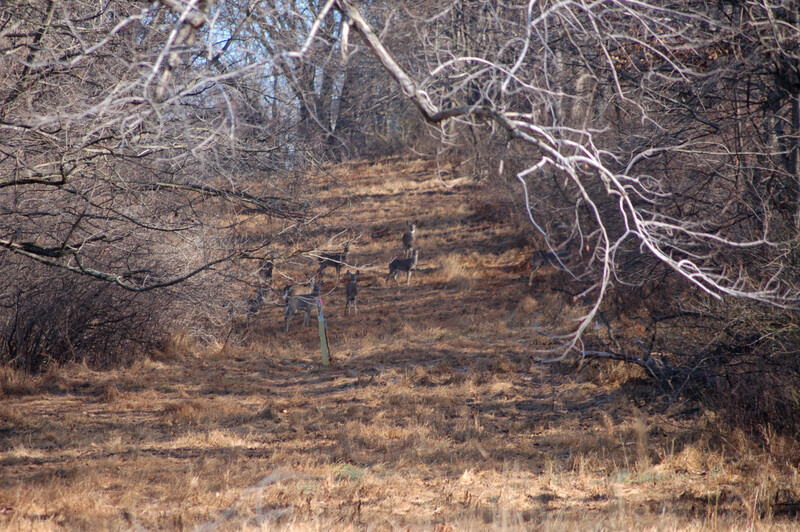 We edged along the field, but the deer had moved down, and over the side of the hill. I told Bob where to go, and I would walk along the hill’s side to try to push any deer towards him. I circled the field’s edge, and two deer came over the skyline. Bob saw them, but couldn’t get a shot. I finally walked the pre-discussed drive, and in moments I heard his shot. 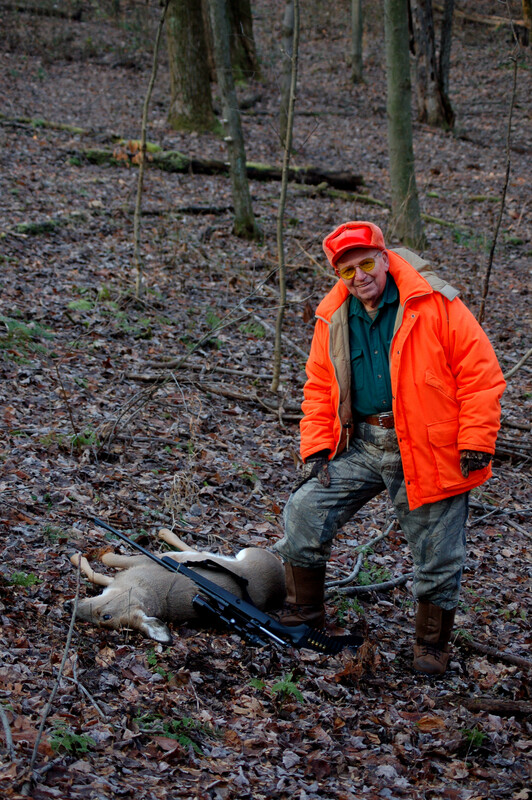 I hurried to his position, and found Bob standing over a nice doe. Bob said ten to twelve deer came through from all directions. One stopped! While we were there with the deer I noticed another deer walking. It was a small spike. Later on, I spotted a nice eight-pointer with does in the distance. 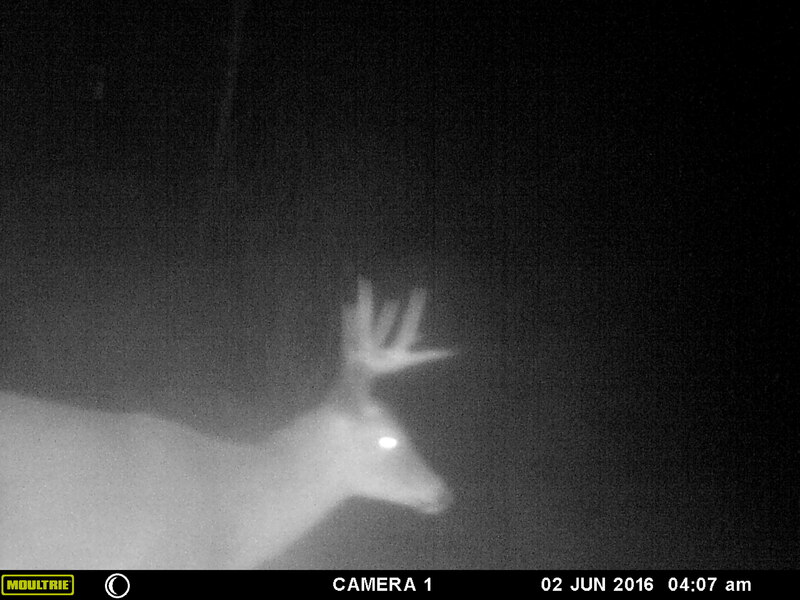 The buck was interested in breeding. The does were not! I told Laurie, and my step-father, Bob, I was only going after bucks this day. I did not expect to deviate from that decision. I had to leave by noon, or so, to get ready for a meal at my in-laws, and I wasn’t wanting to butcher. I saw the first deer early. I couldn’t identify the gender. The brush, and slight fog kept that from happening. I set down on a log, and decided I needed to capture some of this fog on camera. I see beauty in all things. I walked backwards and set down on a log to watch a little. 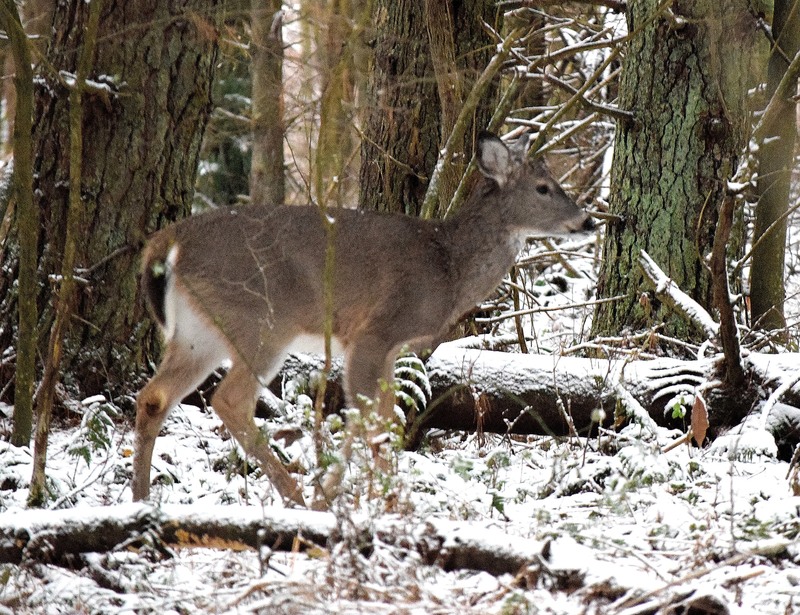 I spotted a doe standing about seventy yards. 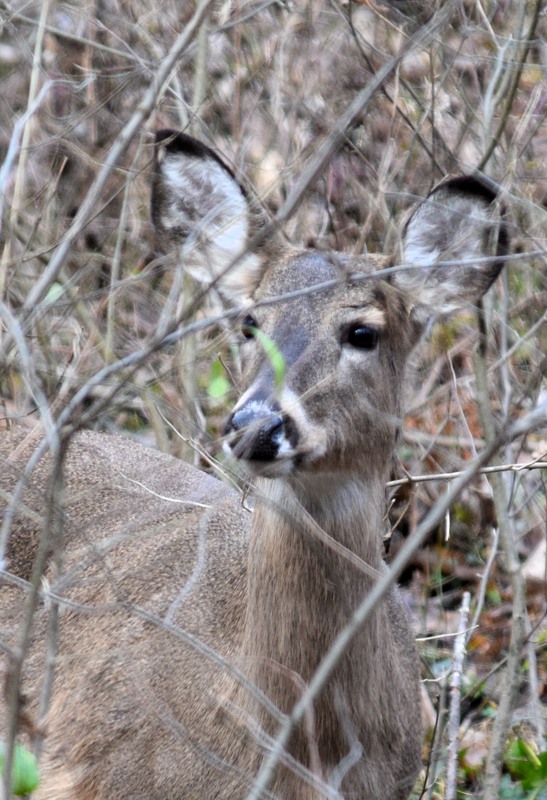 Shortly afterwards, another doe was visible eating ferns. I watched the two for about half-an-hour as they walked away. I was entertained by two gray squirrels, and two red squirrels. 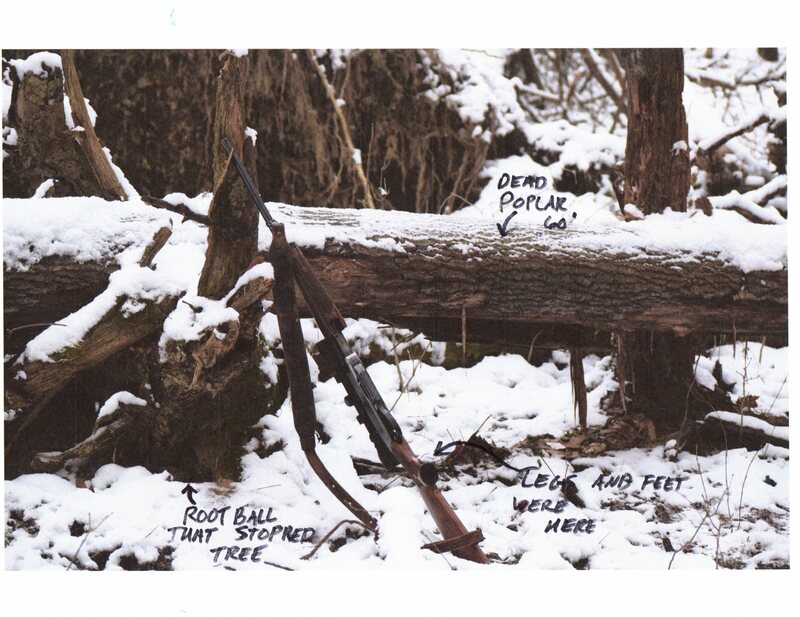 I would still hunt in the area, and walk back to this log from time to time. I could see a deer to my left. I began to reach for my camera when I noticed the antlers. A second late I realized the buck was legal. The scope centered on the front of the deer followed by the shot. The deer dropped before running down slope. I could hear the deer as he dropped again. The drag was a tough one for the buck was big, and heavy. I had to cross a steep gulley, and up a slope before leveling off. There were lots of down trees, with brush, too. I eventually had to drag the deer across Cherry Run. I was beat. Bob, and I struggled loading the buck in Bob’s truck. 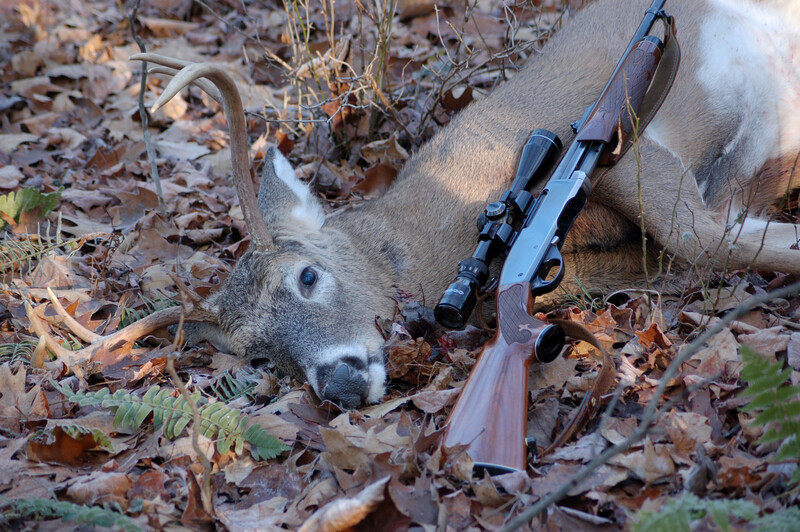 The buck sported seven points with a seventeen inch spread.